Our private, one-on-one training sessions are conducted in and around your home since that is frequently where most problem dog behaviors occur. 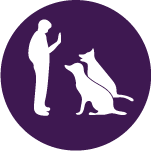 But depending on the needs of our clients and their dogs, we can meet them at a local park, retail establishment or other public place to re-enforce a new behavior or work through a problem behavior they are struggling with. And we always adapt our training to your pets style of learning; using whatever techniques and tools your pet responds to most. You will find more info on each of our training packages listed below. If you would like some help determining which program is best for you and your dog please call the Director of Training, Crystal at 520-820-7252. Our Platinum Program is a daily, multi-session, Board and Train program. The training is customized to fit the specific needs of each student. 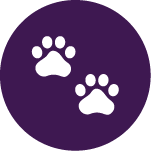 The training is accomplished in a home setting rather than a boarding and kenneling facility. 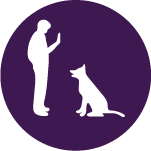 The process begins with a thorough assessment of the behavioral issues you and your dog are experiencing. We then develop a specific-training program tailored to addressing and solving those problem behaviors one by one. We track every session as training progresses and provide you regular video updates during the training and a summary in writing at the end of the training program. Your Platinum Program will conclude with an extensive time of reunion and debriefing during which we teach you in detail what your pup has learned and how to continue to ingrain those learned behaviors with your dog going forward. Additionally, your pup will benefit from both active and passive, pack-type interaction with other well balanced/behaved/obedient dogs all throughout the training program. Contact us to discuss how the Platinum Program can make a difference in the life of your dog and family! Contact us now for pricing information and to schedule your program!